Land Commissioner George P. Bush told the editorial board of Bryan-College-Station’s The Eagle that he believes Confederate Heroes Day should not be a Texas state holiday. He said some consider it a “slap in the face” to celebrate the holiday the same week as Martin Luther King Jr. Day. The younger Bush, son of former Governor Jeb Bush, and the grandson of the 41st president, George H.W. Bush, was reported to have had an hour-long meeting with the editorial board on Friday – Confederate Heroes Day. Bush told the board he would honor the law by offering his employees a skeleton crew day, but he does not think the holiday should continue to be recognized. Elected in 2014 after having no formidable opposition in the primary, Bush is now facing three Republican opponents in March. One of his opponents, former Land Commissioner Jerry Patterson told Breitbart Texas on Sunday that Bush is about a 0-20 no-show at political forums in Texas. Bush is being criticized for his efforts with “Reimagine the Alamo,” as reported by the San Antonio Express-News and other outlets. Patterson discussed the Confederate Heroes Day issue on Sunday during an appearance on Fox 26’s What’s Your Point. The Confederacy has been controversial in Texas as in other parts of the United States. Breitbart Texas was at the August “Destroy the Confederacy” rally in Houston. 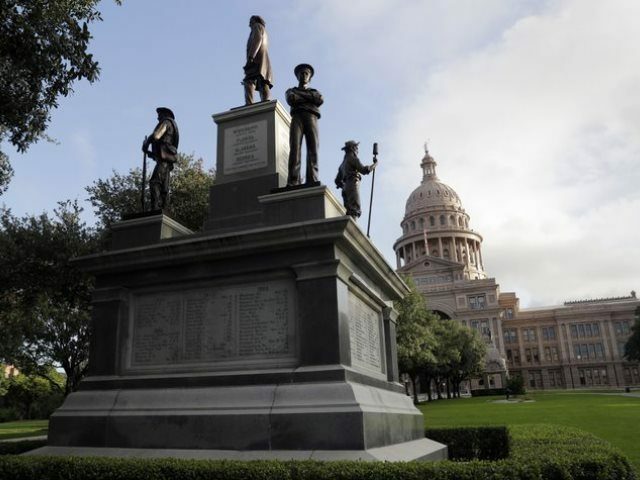 A group “committed to protecting Texas and Texas History,” “This Is Texas Freedom Force” (TITFF), said demonstrators were planning to tear down a Confederate statue. They also warned there could be violence. Black Lives Matter: Houston, SURJ HTX, and public figure Ashton P. Woods promoted the event. Just a few days after the protest, Houston police officers arrested a young man for allegedly attempting to plant explosives at a Confederate statue at another location the night of the rally. Breitbart Texas was on the scene when FBI officials raided Andrew Cecil Earhart Schneck’s home. Breitbart Texas has provided continued coverage about the controversies surrounding the renaming of schools and removing Confederate statutes in Texas.